There's nothing like having an outdoor shower up in the tree tops where you're looking out on squirrels and birds flittering about amongst the foliage! For a very different and hugely romantic experience, why not try the starbed – the chance to sleep under the stars in a 4 poster bed placed on a platform overlooking a busy waterhole! For some folks the whole concept and look and feel of the tree houses could just be too different – never mind, there are plenty of more traditional game lodges to choose from in that case! just because these are tree houses don't think that they are cramped and uncomfortable though – far from it in fact, as these are wonderfully spacious and delightfully styled rooms with no shortage of luxury features! Madikwe has been one of the biggest conservation success stories since it was formed bacl in 1990 – prior to that this massive area of some 75000 hectares bordering Botswana close to the Kalahari Desert was marginal farm land consisting of dusty mealie fields and the only animals were cattle and goats. As soon as the Madikwe Game Reserve was formally declared to be a wildlife sanctuary, husband and wife team Jan and Jaci van Heteren saw the massive potential of the new reserve. 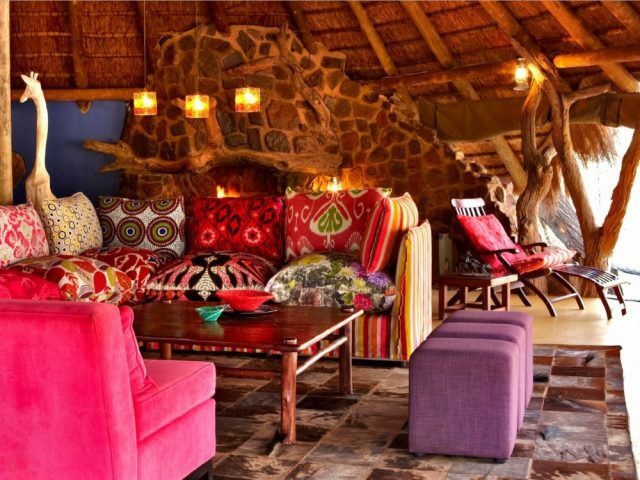 Having developed and then sold their interest in the first lodge to be developed in the reserve, they missed Madikwe too much and returned to develop their dream vision for a family friendly safari lodge and Jaci's Safari Lodge was the stunning result! Jaci's launched to huge critical acclaim and commercial success too and Jan and Jaci then decided to do something new and creative – hence Jaci's Tree Lodge was born! Just because these are tree houses don't think that they are cramped and uncomfortable though – far from it in fact, as these are wonderfully spacious and delightfully styled rooms with no shortage of luxury features! 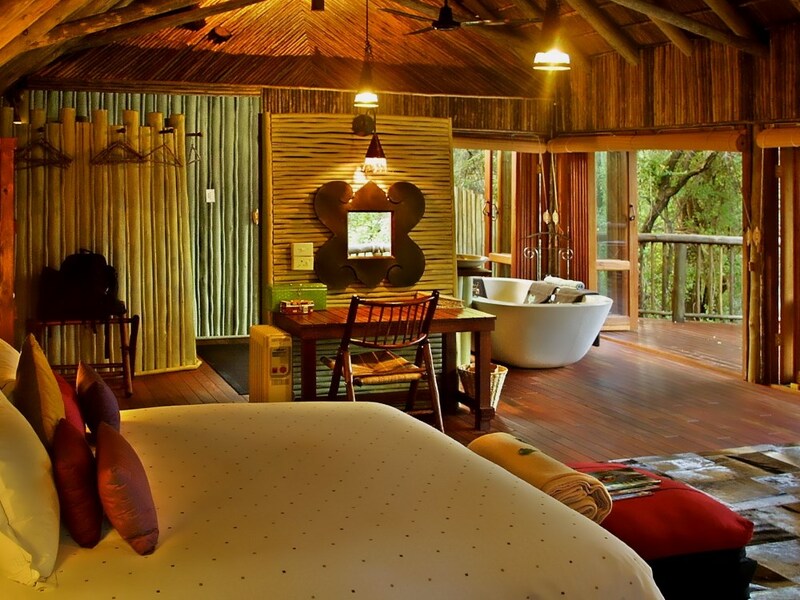 There are en-suite bathrooms for example, with an enormous stone bath and a refreshing outdoor 'jungle' shower from which you can enjoy the vista - honeymoon heaven! All rooms are also equipped with air conditioning, fans and heaters, to ensure your comfort through the year. They're unashamedly different in style to usual game lodge rooms and very attractive too, decorated in vibrant reds and greens - each room also boasts a large balcony, the ideal spot from which to watch the entertaining antics of the resident mongoose families or game coming down to drink on the river bank! Raised, wooden walkways, suspended in the forest canopy and lining the bank of the Marico river connect the tree houses with the main lodge. This spacious open-plan building includes a magnificent bar and lounge area, while separated from the lounge by a four sided open fireplace is the luxurious dining room - here you can eat your fill of bunch or high tea! You can also experience dining on the deck above the forest floor or enjoy dinners around a roaring open fire under the stars in the boma! Whether you choose to relax on the deck in front of your room, wander to the forest pool to cool off, listen to the sounds of the bush, or curl up with a good book by the fireplace, this luxurious yet somehow playful environment makes for a unique bush experience! Whilst the lodge itself is gorgeous, the other highlight are the twice daily game drives. It took some six years to capture and move different game species from other reserves to Madikwe, the world's biggest wildlife relocation project called Operation Phoenix! This has produced stunning results, with this 75 000 hectare reserve now boasting prime Big Five game viewing as well as perhaps the best sightings in the country of the highly endangered African wild dog! 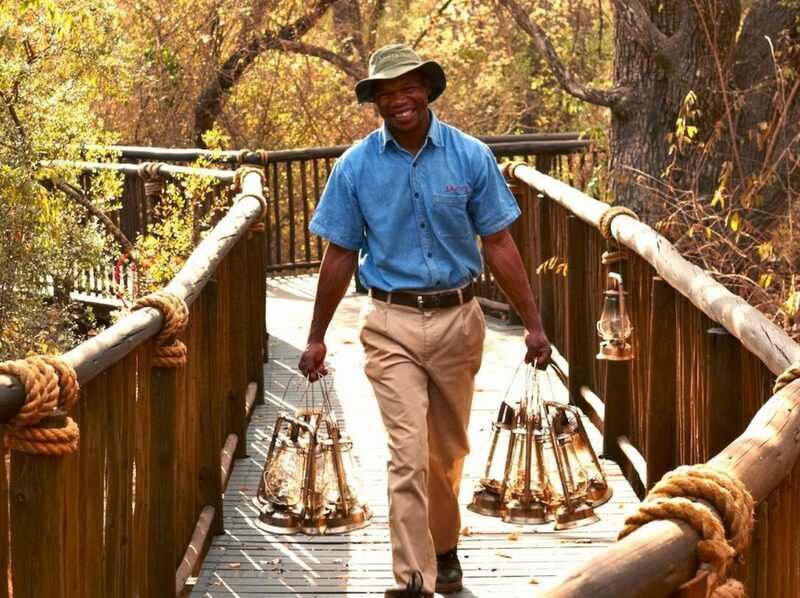 The 2 Jaci's lodges pride themselves on their experienced and skilled team of rangers - over and above a wealth of knowledge on local fauna, they have wonderful stories and snippets of information, all of which is guaranteed to make your game drive fun and informative. Walking safaris are offered for the more adventurous, where you will be tuned to every sound and smell, offering a completely different experience from game drives - as they say here "taking a game drive is like watching a movie, while walking in the bush is like reading a book!" Another great experience is the small hide overlooking the waterhole and wetland area, where you can observe the game coming down to slake their thirst or catch ellies having a bath! 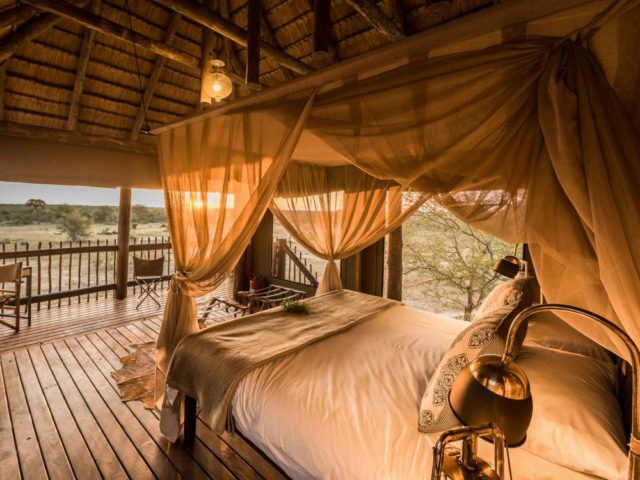 Perched on top is also a four-poster bed, where those adventurous types can enjoy a night out in the wild under the African sky and experience game at night from this special vantage point – definitely an experience not to be missed!